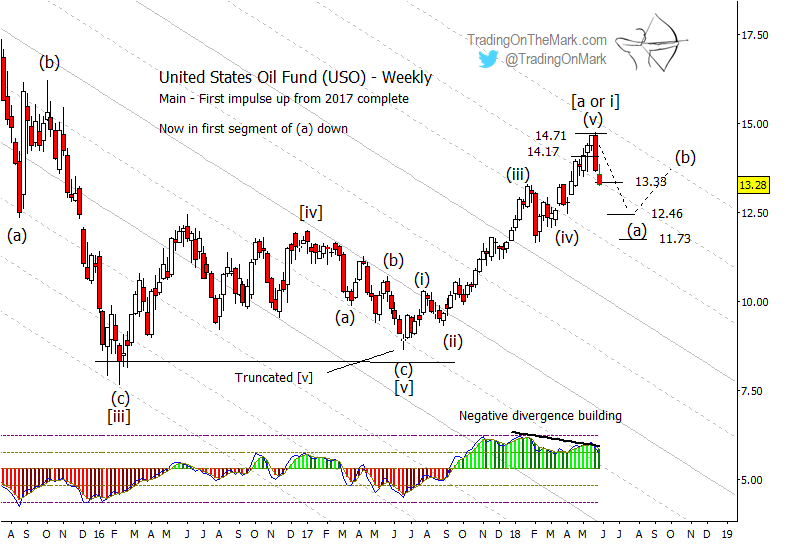 In our April post on this topic, we showed how the crude oil rally from last year’s low was probably nearing its end. 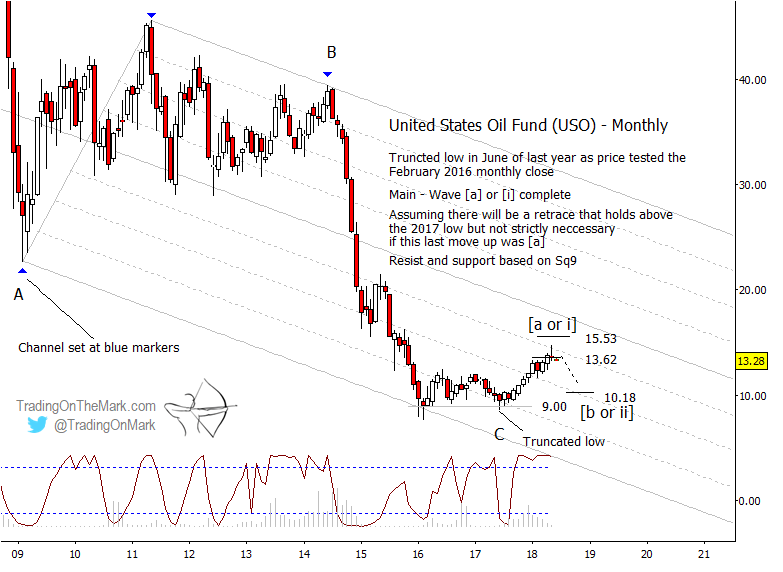 Although price tested some resistance levels above those we mentioned last time, the five-wave form now appears complete or nearly so for the United States Oil Fund (NYSE Arca: USO). On a monthly chart, price tested and closed beneath the Gann square-of-nine resistance level at 13.62. A similar resistance level hovers overhead at 15.53, but there’s a good chance a reversal will kick in before the higher level is tested. Keeping with the big picture, a downward retrace from near the present area should cut into a substantial part of the rally from 2017. A prominent Gann support level awaits at 10.18, and it is conceivable that price could even push beneath the 2017 low of 9.00 as part of a corrective pattern. A weekly chart makes it easier to see how the rally can be called complete. We have seen five waves up from the 2017 low along with significant momentum divergence. Also price has twice put in a weekly close beneath a prior resistance level at 14.17. Keep in mind that the support targets at 13.33, 12.46 and 11.73 on the weekly chart will probably be most relevant to downward wave (a) — the first part of a downward correction. A corrective pattern could use any of those levels to bounce before attempting to push lower. The downward trade will probably be choppy as price navigates its way through a correction that could last several months. If the trader manages to get a good entry price, this approach might be ideal for “summer trading” with a scaled-down number of shares/contracts and a bit of patience.